Black Caviar is on her way to Britain this week as she begins the journey to take part in the Diamond Jubilee Stakes at Royal Ascot. After becoming one of the legends of Australian racing, those interested in NoveltyBetting note how the horse is to take part in one of the most famous British horse races and it has got many punters extremely excited. With 21 victories from as many races, this horse really is quite something and the background team will be hopeful that all the travelling is worth it come 23rd June. Arriving in Britain on Friday, Caviar is a massive favourite for the race and will even receiving plenty of backing to win by five lengths or more. 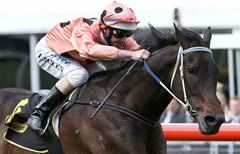 As for the journey Black Caviar is undertaking, David Robson – who is heading the transportation of the sprinter – has said that plenty of planning has been involved. "But a horse like Black Caviar can bounce back in the first week. It will take a bit of time to acclimatise coming from Australia in the southern hemisphere where it is closer to winter and being in England where the weather is fairly decent. It'll probably take a week to recover fully." Overall, a lot of effort has gone in to get this horse to compete in the Diamond Jubilee Stakes and it will be interesting to see how things pan out. It certainly adds an extra spice to the occasion and has got people talking about the race weeks in advance.